Firstly, what is Zen? Zen is a peace that becomes with an entity other than yourself, yet is part of your conscious Self and encompasses the whole of Self. It is of being aware of the oneness with the natural world; the total togetherness of body and mind. It is where we find personal peace in a world of materialistic superficiality.To experience Zen is to feel separate from material externalities; a type of floating state; a state whereas one is not swept away by external materialism; and touching the essence of Self within; bringing an enjoyment and tranquillity within. It is therefore becoming an observer of Self, and being part of our within. To achieve Zen we must become observers of Self, and reach this higher state of Natural-Self. This is also called: "Our Divine Nature Intelligence." Our Consciousness of Self. Mitchell Zen evolved as this definitive identity over many years. Although as a younger person he felt life wasn't quite right, he couldn't understand why. It wasn't until he sat on the balcony, after another milestone in life and asked himself: "What now?" And realised something was terribly wrong. Is this what life is? Another achievement? Another search? He realized at that moment it was all external and nothing fitted internally. It was like looking at an A4 piece of paper and knowing there was something written on it, yet couldn't see the writing. Something was missing and he wanted to find it. I write this in the third person (outside looking in) as this is how I feel. I regard myself as two identities (and am). Because of this I can 'outside look' and recognise the two identities of me. The first identity is the person who was nurtured; believing our society is all we should believe in. The second identity is the person who found out our society is not what we should believe in; and finding also the person who is truly aligned to nature and the past - biologically. To explain society: we have been programmed to fit into our economic situation for economic society to survive, with it's surrounds, without thinking there is another Self. This Self is what is within us, separate to societies influences. Which is why many feel lost and keep on searching for a reason in life. This economic survival is hard to contend with because it is not aligned to Natural Self. I struggled with that also until I decided change is required and look for answers. I began questioning everything I originally believed was right. Even being nurtured as a child. I separated myself from externalities. I didn't read initially but got in touch with myself (inside) and felt: "What is contentment, who am I really." Once I found/felt 'myself' within I began reading to see if there was something in what I'd found. And I did. What I felt and knew was right! Citizens in our society have been programmed to believe in our absolute economic society - for its survival only. It is not from the sense of belonging with Self but rather mechanistic and superficial life. I then developed my life around this spiritual sense of Self. In touch with something more profound than society could offer. It led to this present stage in life whereas I can truthfully say I am Mitchell Zen. But why Mitchell Zen? Over many years I felt something deeply about Self and had written a number of articles over a long period of time, presented speeches and powerpoint presentations, on my thoughts and philosophies regarding life within self in contrast to societal life. One day I was approached and told: "What you are talking about is similar to Buddhism." I had not studied religion (or Buddhism) because I felt it worshipped an outside force and I knew we have an inner intelligence which is aligned to nature and the universe. I was curious though, and started to study this new knowledge and found yes, much of what I feel was related to Buddhism and in particular Zen. I was also enlightened to find I had, over many years, been practicing the ancient knowledge of Zen and taken these thoughts, and fitted them in this 21st century. I also found the spiritual reason for this: I am ancestrally/heritage aligned to Zen-Buddhism. Thus the ancient mysticism of Zen has naturally guided me over my lifetime. My Being is intrinsically formed within the mysticism of Zen and is not a doctrine religion. Reaching under the facade of symbolistic religion can evoke the true meaning: "To experience and connect our lives to the divine and the transcendent, as a way to enhance our sense of meaning and purpose." In its purest form, and the aim, is to: "Know our True-Self, Our Divine Nature Intelligence, through the process of reaching Inner-Self." Unfortunately, doctrinism disguises Self whereas Zen elicits Self. A simplistic meaning of Zen is: "Enlightenment by direct intuition through attaining a state of (self) consciousness. It is totally different from the normal waking state, enabling ourselves to fathom all levels of Self and experience consciousness within (divine intelligence) thus gaining the ability to see life through Self in its true sense." Zen in its very nature defies the analysis of logic; where logic is the most characteristic feature of Western thought. The basic idea of Zen is to come in touch with the inner workings of our Being where the truth lies in our inner Being. My identity had already been created many years previously (external and internal), yet when I started to venture out within the social realm of the registered club structure, as this identity, my headwear was questioned in some areas. Also my complete attire, in some way, was deemed anomalous. To rectify this abnormality, and verify/authenticize myself as Mitchell-Zen, I created a document explaining in one way, Mitchell Zen. This has been accepted in most registered clubs. The following is the document I prepared for Mitchell Zen, for within our societies constrictive beliefs, as a Cultural Diverse Identity in our Multi-Cultural Australian Society. Ethno relates to different societies and cultures. Religion is a set of beliefs and practices, usually shared by a community or group. Spirituality is a practice that has to do with having a sense of peace and purpose. It also relates to the process of developing beliefs around the meaning of life and connection with others. Culture is relating to the ideas, customs, and social behaviour of select social branches. Also known as Ethno.
) and has redefined the philosophies within this 21st century, enabling the knowledge of personal peace and mental health homeostasis is achievable in this century. Mitchell Zen is an advocate for people in their journey to find this personal peace. Cultural safety and established Cultural Identity incorporates a set of prerequisites that all people should be able to obtain. These include, a sense of belonging, personal fulfillment, cultural security and the right to participate within an all inclusive social network and feel culturally safe, comfortable, accepted, and respected through embracement of cultural considerations. Ethno/Cultural headwear that wraps the head is an important metaphysical barrier to the external world and encompasses the necessary transcendental consciousness to maintain and produce an inner peace, contentment, and belonging to self. It is self-empowering and part of the individual’s belief system. Mitchell’s devotion to change over a lifetime, has captured and transitioned to another reality within this 21st Century and incorporates the Zen traditional philosophies; developing articles with new meaning and develops re-newed improved visionary teachings for mental health stability. Mitchell has been a follower, practitioner (a person actively engaged in an art, discipline or profession) and an active participant of finding Zen psychosomatic life philosophies within a lifetime. This is a personal development from an established biological and psychosomatic relationship with a Divinity of Ancestors; a connection with a Cultural Existence of Spiritual Connectivity. Mitchell developed into a writer and advocates on the benefits of the philosophies of Zen, consciousness, energy fields, new realities and mind/body communication. Enabling personal psychosomatic homeostasis to develop self-actualisation and find self. Redefining and developing the philosophies of Zen, Mitchell has established a philosophical connection & disconnection with our mechanistic society, enabling the knowledge of personal inner peace is achievable in this 21st century. He is a writer and advocate for philosophies that change the assumptions of society; aimed at improving the mental health of individuals in our society. Zen is a practice that needs to be experienced to understand. Zen is a mixture of Mahayana Buddhism and Taoism and encompasses a variety of traditions, beliefs and spirituality. Zen comes from inner development (an energy field that is part of our divine intelligence) and requires years of dedicated insight and observation leading to self-enlightenment. This separates the societal environment from self, enabling living on the middle road and experiencing both sides of conscious reality and consciousness transcendental reality. Zen experiences are in some ways a parallel universe within Self, developing the ability and awareness to see and experience life in its true natural state. Zen is seeing into one's true nature, our innermost wisdom, pure and divine. "Zen is not a pastime, but the most serious task in life. No empty head will ever venture near it." D.T.Suzuki. Zen emphasizes focus and intent, dhyana (a series of cultivated states of mind), which lead to a state of perfect equanimity and awareness - mindfulness, concentration, supra mundane powers (transcending the physical world), tranquility, and insight; insight into nature, and the personal expression of this insight in daily life; especially for the benefit of others. Zen is one of three main existing branches of Buddhism within the classification of philosophies (the study of the fundamental nature of knowledge, reality, and existence) and practice. Zen is the path to complete spiritual enlightenment for the benefit of all sentient beings (able to perceive or feel things). This establishes the Dharma (cosmic law and order) leading to enlightenment; and can be attained in a single lifetime. To enter the Dharma Gate requires self-study, practice and experience. Reaching Self is characterised with purity and the state of self-realization. Bodhi-dharma was regarded as its first Chinese patriarch. The goal of this philosophy is nirvana (a higher state of being) and to achieve this needs an investigation into the nature of the world, and the true nature of life and seeing all attachments as distractions (mechanistic society). Enlightenment (Bodhi-awakening) is reached by spiritually detaching from these attachments and transitioning to the inner purity state of self. Continuance of vigilant self-study and discovery within these both worlds (society & philosophies) is important for conveying this transcendental state into teaching the pathways leading to the inner purity state of self; a state of self-actualisation (the realization of one's potentialities). By reaching the state of one's potentials we are able to progress to the Zen state of enlightenment and spiritual awakening. Unlike Christianity Zen does not look to any external being or power for their respective solutions to the problem of existence. Zen experiences a central inner power (pure inner intelligence) that gives one the solutions to understand self and project the inner intelligence as self-empowering. Liberation (nirvana) is attained by the combination of mindfulness and dhyâna (deep mental concentration) and is commonly translated as a practice which alters the state of mind; a series of cultivated states of mind; which lead to state of perfect equanimity (self-possession) and awareness; to recover consciousness (the state of being aware of and responsive to one's surroundings); capture natural religious truths, and not mythology (generational traditional stories). Giving verbal and narrative expression to this attainment is a requirement to teach others that inner peaceful enlightenment can be reached within this 21st century and beyond. Zen relieves one from perceived spiritual bankruptcy and the complexity of Western life, including anxiety and stress, and has become the fastest growing philosophical religion (the study of the fundamental nature of knowledge, reality, and existence) in Australia. It must be remembered that our materialistic western culture is not improving mental health but rather blocking the inner Self receptive capacity for mental health homeostasis. What we do in life is not necessarily what is. Symbolizes the interconnectedness of all things. An eternal web and the continuous cycling of existence. There is no beginning or end but the timeless nature of our spirit. The infinite cycles of birth and rebirth in both physical and *ethereal realms (*extremely delicate and light in a way that seems not to be of this world). A westernisation bandana is a type of large, usually colorful, kerchief, usually worn on the head or around the neck of a person or pet and is not considered to be a hat. 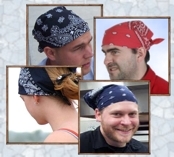 These bandanas are frequently printed in a paisley pattern and are most often used to hold hair back, either as a fashionable head accessory, for practical purposes, or vanity. Western society label some headwear as bandanas for simplistic characterization. Ethno-Religious-Spiritual-Cultural Headwear is a piece of material, in different formats, folded definitely to enclose the head. Covering the head represent the acceptance of Divine sovereignty. A testament to their faith and has a kabbalistic [mystical] significance & becomes significant and valuable to the wearer. It is sense of security and belonging; and inclusiveness with self; of belonging to a certain group of people and of commitment to a certain way of life. There are no requirements as to how it should be made, yet some faiths say it should cover most of the head, to provide this belonging & inclusiveness with body & mind. It is important to remember, Ethno-Religious-Spiritual-Cultural Groups are made up of individuals, with each person being unique in his or her own way. * A Hachimaki (”helmet-scarf") is a stylized headband (bandana) in Japanese culture, usually made of red or white cloth, worn as a symbol of perseverance, effort, and/or courage by the wearer. * The word Bandana is the Hindi 'bandhnu' and in Urdu 'bandhnu' meaning a tied, bound cloth bandana as a precious symbol or culture and religion. * In Islam, they wear bandana as part of their religious belief and they refer bandana as hijab. It was originally black, but as the time passed by other colours became available in an attempt to make bandana a headgear that will easily match the clothing. From childhood we have been educated to only examine and verify the external world. No one has taught us to look within, to find within, and to verify within. We thus remain strangers to ourselves, while trying to get to know others. Resulting in confusion and disappointment in life. and involving social inclusion for Multi-Cultural Diversity Australia. Anti-discrimination laws promote equality. These laws protect individuals against discrimination on grounds of race, colour, gender, sexual preference, age, physical or mental disability, marital status, family or carer’s responsibilities, pregnancy, religion, political opinion, ethnic, national extraction or social origin. These laws are not adhered to in some sectors of society and need advocacy reform for change. The 20th century saw the emergence of esoteric visionaries, pioneers, prophets, scholars & physicists, advancing neuropsychology, electron physics, quantum theory, biophotons, metaphysics, psychometry and more. Developing these new fields for consciousness enlightenment within the biological & psychosomatic transcendental awareness. It all gave more meaning to the philosophies of Zen/Mahayana and other relevant insights into nature, and constructed a definite biological and neurological pathway for understanding life, rather than subservience to the economic emotional dyslexia, resulting in mental health abnormalities. Mitchell’s development of enlightenment developed along a spectrum of transcendental inner awareness, to observation along the middle road, to experiences in mechanistic society. Without (experiencing) these three areas one is unable to reach mindful awareness. Experiencing mechanistic society and leaving this state is the requirement for establishing methods of awareness and the importance of personal expression of this insight. His articles on these esoteric subjects are read by hundred’s of followers per month; with speeches on these subjects providing an insight into another transcendental world which develops mental health peace. Mitchell’s devotion to change, has captured and transitioned to another reality within this 21st Century and reshaped the Zen traditional philosophies with new meaning, incorporating re-newed improved visionary teachings. .The following is a graphic that symbolises the journey to find personal awareness. One of the most difficult aspects of life is change. The other is to question everything you had believed in, in life. When one finds this anomoly the final difficulty is to rationalize this new reality and live with a balance. Many dismiss this reality as it is too much to rationalize and live life with this knowledge. I have, yet it has taken strong mental descipline to fascilitate this knowledge to live a life of harmony with self. For me I mentally isolate both worlds (as per the picture) and live within the consciousness-self as a type of detachment. I remember working long hours and trying intently to live the life I wanted. It was a struggle. When work was finished, stepping on the bus home was the time when I switched to my consciousness-self. Without these experiences I could not write like I do now, nor could I have a full understanding of both worlds. I see people struggling to obtain shifts to earn money, competing for jobs and raising children in this environment. How difficult it must be when they live in this mechanistic society. I ask a lot from them, to consider another way, another life. Wouldn't it be better to learn about ourselves and why we react the way we do, rather than replay continuous societal anxieties that affect children in the most negative way, leading to their own mental health conditions later in life? This article is also about life change, and a cultural change, leading to a harmonious life. With a transformation to another reality. A reality that I would like you to consider and see where it leads to for you. It has its origins hundreds of years ago. If that is the case, then what I'm saying has much validity. If you decide to venture into another reality I wish you well. It will change you, and for the better. It will also change people around you, for the better. It will transform your life to a new understanding. Stay focussed and gently progress to find your Inner-Self. My cultural (visual) change has had positive and negative consequences. Most have been positive within societal terms, yet at times processed with caution and intrigue. This leads to judgment and maginalising from the lack of understanding. It is also narrow thinking stemming from archaic ideologies. It is fundamentally wrong and for this I would like to advocate for change, and attitudes, enabling all parts of our society to enjoy inclusiveness, and acceptance that a spiritual identity is also associated with clothing worn - it is important for one's self worth. A Journey to Understand Ourselves, towards the Development of Self Peace. A journey of understanding our two selves, and lives, within our society, and the complex issues that society impacts on us. Together with an understanding of finding personal peace and enlightenment within our psyche. Includes two confronting reality stories from our Australian society.